How Long Does it Take for Walk-In Tubs to Fill and Drain? There are a number of factors that impact the fill time and drain time, including the size, age and quality of the existing plumbing; water pressure at your home and the size of the walk-in tub. The main factors that will affect how long it takes for your walk-in tub to fill are home water pressure and the size of the walk-in tub. Typically, it will take a few minutes to fill, but, naturally, it depends on the tub size. One precaution prior to purchasing a walk-in tub? Your water heater should be a minimum size of 40 gallons for a standard-sized tub, and larger for larger tubs. When purchasing a walk-in or spa bathtub, be sure to ascertain the exact number of gallons the tub will hold when full. Typically, if your tub now drains at a reasonable pace, your walk in tub will as well. Usually it will take 2 to 4 minutes for the tub to drain if the tub is installed correctly and existing drain lines operate properly. For more information about bathroom remodeling including walk-in tubs, spa bathtubs and roll-in showers in metro Atlanta or north Georgia, please contact us by telephone at 770-880-3405. What are Walk-In Bathtub Air Jet & Water Jet Hydrotherapy Systems? A water-jet system uses a water pump to produce massaging streams of water. The water-jet system will produce a more concentrated massage. A hydro-massage system with back jets can provide a nice, relaxing back massage while bathing, helping to ease muscle pain and increase flexibility. An air-jet system will blow warm air into the water creating a light hydrotherapy massage, generating thousands of tiny air bubbles, preheated to a temperature comfortable for you. Typically, the air jet and hydro systems are equipped with controls to adjust both the air and water jet systems to allow users to increase and decrease water pressure or air coming out of the jet system. The popular deep soaker tub offers a complete system with hydro and air massage for a luxurious bathing experience. 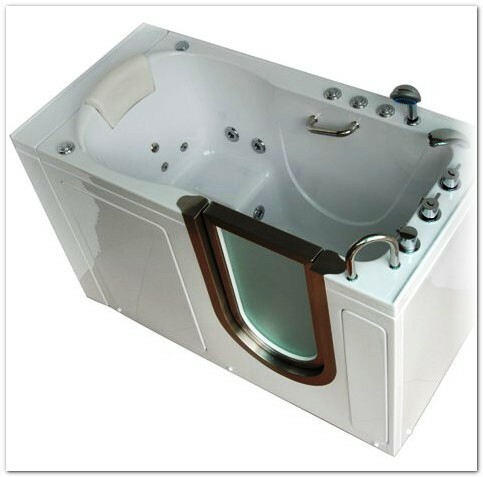 The dual massage hydrotherapy walk in spa tubs we offer come standard with a warranty that covers the door seal, spa frame, fiberglass shell, and lifetime workmanship and labor, providing the peace of mind you need to feel confident that your investment is a one time purchase promising reliability and durability with excellent customer service. People often ask, is an in-home assessment important and necessary before I can get pricing estimates on a walk-in bathtub or spa bath? Many aging in place bathroom remodelers attempt to give detailed information and price quotes over the phone without meeting you, seeing your home, or performing a home assessment. Steer clear! It is necessary to do an in-home assessment prior to specifying equipment and providing prices. 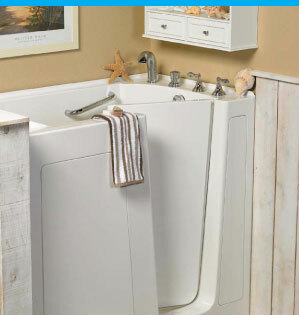 Different models of walk-in tubs and spa baths vary in pricing, due to the size, features and quality. A “soaker tub” with no jets will cost less than one with air jets and hydrotherapy. An in-home assessment is necessary in order to determine the type of tub appropriate for you and your home. Factors that impact the walk in tub installation may complicate the installation and impact the price. Installation not only involves plumbing, carpentry, and electrical work; new finishes may be required such as flooring, tile or paint. The bathroom remodeling design consultant has the expertise you need to solve all of the details to create an attractive space that functions well. For more information about bathroom remodeling including walk-in tubs, spa bathtubs and roll-in showers in metro Atlanta or north Georgia, please contact us by telephone at 770-880-3405. Walk-in Bathtub or Accessible Shower for your North Georgia Home? We serve the Atlanta metropolitan area including Dacula, Dahlonega, Dalton, Decatur, Duluth, East Point, Fairburn, Fayetteville, Flowery Branch, Gwinnett, Forsyth, Dekalb, GA, Mableton, Marietta, Acworth, Alpharetta, Athens, Austell, Bogart, McDonough, Monroe, Gainesville, Newnan, Norcross, Peachtree City, Riverdale, Rome, Roswell, Snellville, Stockbridge, Suwanee, Toccoa, Tucker, Warner Robins, Winder, Woodstock, Greenville, Griffin, Jackson, Jefferson, Jonesboro, Kennesaw, Loganville, Buford, Canton, and Carrollton; in Georgia and South Carolina.